Unlock the mysteries of Scandinavia and Russia. Discover your favorite shade of blue in the Greek Isles. Sip Chianti while strolling through a lush vineyard in Italy. There’s no better way to experience the history, the landmarks and the culture of Europe than on a Norwegian Cruise Line® sailing in Europe. Norwegian has eight award-winning ships in Europe, including some of the line’s newest and largest ships like the Norwegian Escape and Norwegian Getaway. 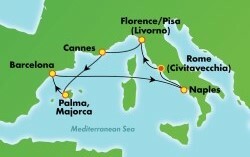 Book a Norwegian Europe sailing of four nights or longer and choose from among these five special offers. * Studios and Inside staterooms pick one; Oceanview, Balcony and Mini-Suite staterooms pick two; Suite and The Haven guests get all five! Bonus Free or Reduced Airfare Offer: Book select 4-night or longer Norwegian Cruise Line Europe sailings by April 5, 2019, and get free or reduced economy-class, round-trip airfare from select departure gateways. ** Applies to first two guests in an Oceanview stateroom or above. This offer is combinable with Norwegian’s Free at Sea offer. Offer are not applicable to stateroom categories IX, OX, BX or MX. Free at Sea offer good on new bookings only until further notice. Subject to availability. Offer good through April 20, 2019. Mention promo code “FITOBC” at time of booking. Combinable with Free at Sea and other Norwegian offers. New bookings only. Subject to availability. 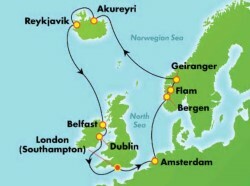 Book Your Norwegian Cruise Line Europe Sailing Today! Call 855.645.2215 to Book Your Norwegian European Cruise Today! **NORWEGIAN CRUISE LINE FREE OR REDUCED AIRFARE OFFER TERMS & CONDITIONS: Booking Window: April 01, 2019 – April 5, 2019 11:59 pm EST. Applicable Sailings: Select 4+ Day. Cruises Offer is not applicable to categories OX, BX, or MX (Sail Away Categories). Offer is not applicable to Studio or Inside categories. Offer not applicable to 1-3 night sailings. Offer is for new individual FIT reservations only. Qualifying new individual FIT reservations can be moved into an existing FS speculative group and count towards tour conductor credits. Offer is not valid for affinity or tour operator groups and cannot be held as group block. Promotion cannot be held as group block. Singles paying 200% of voyage fare qualify. Anything consumed above the promotional benefit will be the responsibility of the guest at prevailing rates. Government taxes, port expenses & fees, discretionary onboard service charges and/or gratuities are additional. Cancellation Fees also apply based on the booking/sailing date; therefore, Norwegian Cruise Line strongly recommends the purchase of travel protection on all bookings. Not applicable to chartered dates and group types: CMI OP EVENT, CMI OP LG EVENT, INCREG & INCLARGE. No components included in this offer have any monetary value, are non-refundable and non-transferable. Offer and combinability with other promotional offers is subject to change at any time per Norwegian Cruise Line’s discretion. Other restrictions may apply. Norwegian Cruise Line reserves the right to cancel or withdraw this offer at any time. Applicable to NCL MIAMI. Not applicable to NCL INTL, AUSTRALIA, NCL BRAZIL, NCL ASIA or CE and UK offices. Reservation must be made more than 16 days prior to sailing to qualify. Air offer applies to economy, round-trip flights from select departure gateways only and will automatically apply. Air gateway(s) must be entered in order to prompt free or reduced airfare. Offer only valid on select 4+ day cruises. Blackout sail dates are at the discretion of Norwegian Cruise Line. 3rd-8th guests will receive $50 off Norwegian Cruise Line’s regular air/sea rates each way. Guests may request to deviate air when selecting the free or reduced air option. 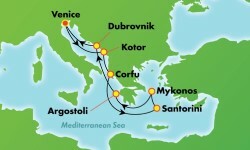 Deviations of up to 2 days pre/post cruise will be charged $25 USD per person; secondary land package must be selected. No other deviation requests will be permitted. Offer includes air taxes, fees & surcharges. Guests are responsible for airport transfers at an additional cost if selected. Airline imposed personal charges such as baggage fees may apply. All guests booked within a singular reservation will be booked on the same flight. Norwegian Cruise Line will book guests’ airfare with a maximum of one connection when possible; air schedules permitting. Norwegian Cruise Line reserves the right to select an alternate airport within 60 miles based on itinerary, choose the air carrier, routing and city airport from each gateway city and reserves the right to substitute commuter service and/or charter air service for scheduled air carriers without prior notice. ***TRAVEL LEADERS NETWORK EXCLUSIVE ONBOARD CREDIT OFFER TERMS & CONDITIONS: Booking Window: March 21, 2019 – April 20, 2019 11:59 pm EST. Applicable Sailings: Select 3+ Day. Cruises Offer is not applicable to categories OX, BX, or MX (Sail Away Categories). Offer is not applicable to Studio or Inside categories. Offer not applicable to 1-2 night sailings. Offer is for new individual FIT reservations only. Onboard credit per stateroom for select 3 to 7-night sailings: Oceanview, $25 USD; Balcony, $50 USD; Mini-Suite, $75 USD; Suites & Haven, $100 USD. Onboard credit per stateroom for select 8-night sailings or longer: Oceanview, $50 USD; Balcony, $100 USD; Mini-Suite, $150 USD; Suites & Haven, $200 USD. Onboard credit per stateroom for select Europe sailings: Oceanview, $75 USD; Balcony, $150 USD; Mini-Suite, $200 USD; Suites & Haven, $300 USD. Use promo code FITOBC. Based on availability. Combinable with Free at Sea offer. Not applicable with group programs, Sail Away rates and special fares. †TRAVELER PLUS POINTS-FOR-CRUISES BENEFIT TERMS & CONDITIONS: In order to apply any combination of annual, biennial, borrowed or rented Bluegreen Vacations Points for payment, cruise fare, including base fare and taxes, must be a minimum of $500 per person for the first and second passengers in a cabin, for a total minimum fare of $1,000. Benefit applies only to active Traveler Plus members. Fares shown are in U.S. dollars and are per person, based on double occupancy. Government taxes, fees, and fuel supplement (where applicable) are additional. NCL reserves the right to charge a fuel supplement without prior notice should the closing price of West Texas Intermediate Fuel increase above $65 per barrel on the NYMEX (New York Mercantile Exchange Index). In the event a fuel supplement is charged, NCL will have sole discretion to apply the supplementary charge to both existing and new bookings, regardless of whether such bookings have been paid in full. Such supplementary charges are not included in the cruise fare. The fuel supplement charge will not exceed $10.00 per passenger per day. Prices are based on availability and subject to change. Guests are advised to carefully read the Terms & Conditions of the Guest Ticket Contract, which affect your legal rights and are binding. Great Vacation Destinations, Inc doing business as Bluegreen Travel Services, is located at 4960 Conference Way North Suite 100, Boca Raton, FL 33431. Great Vacation Destinations is an Iowa Seller of Travel No. 688, Washington Seller of Travel No. 602-283-711; Florida Airlines Reporting Corporation (ARC) registration No. 15-72225-4, California Seller of travel registration No. 2068362 (Registration as a Seller of Travel does not constitute approval by the State of California). Void where prohibited by law and where registration and/or licensing requirements have not been meet. In the event of a conflict between Norwegian Cruise Line’s Details of Participation and Great Vacation Destinations’ Details of Participation, Norwegian Cruise Line’s Details of Participation shall govern.